In between a bar and a bookstore in North Beach, San Francisco is an alley where Jack Kerouac was chucked after a particularly boisterous night of boozing. The bar, Vesuvio, and City Lights Bookstore were popular hangouts for the iconic founding father of The Beat Generation and his clan. 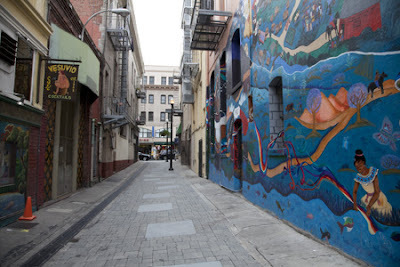 Jack Kerouac Alley connects North Beach with Chinatown and is about 60 feet long. On the walls flanking it are murals. You can pick up copies of Kerouac’s and his Beat brethren’s prose at City Lights and have a drink named after him just a few steps away. 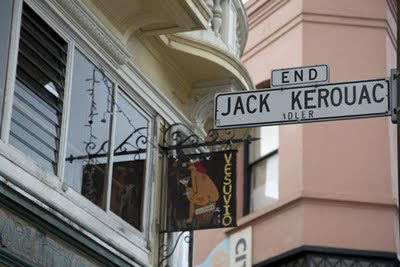 Be sure not to suffer the same fate as Kerouac in the alley though - his namesake cocktail consists of rum, tequila, orange/cranberry juice and lime served in an extra large glass. 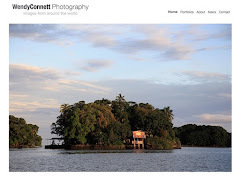 How picturesque! I've been debating about visiting San Francisco again and this gives me another reason to go. how did you manage to capture the alley without anyone in it? Lakshmi and Fly Girl, SF is a great city to visit-beautiful and interesting. Photo Cache-I waited for about 1/2 an hour (taking photos with people) and took advantage of a 2 minute window to photograph empty.